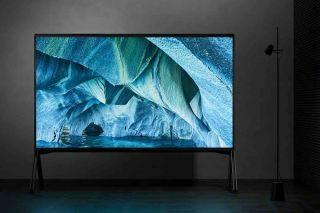 Sony 2019 TVs: 8K, 4K, Full HD, OLED – everything you need to know | What Hi-Fi? The full details of Sony's 2019 TV range are in - and it's looking like a bumper year for one of the biggest brands in the business. The big news is the launch of the first Sony 8K TV, which is LCD-based and sits at the very top of the overall range. This model represents a continuation and development of the Master Series, which Sony launched to much acclaim just a few months ago, and which also features a 4K OLED model. These models are called the ZG9 and AG9 (Z9G and A9G in the US) respectively, and they've understandably generated oodles of excitement, but they're also destined to cost more than most people can justify. Good news, then, that Sony has also announced a whole raft of models for those of us who don't have a property portfolio. And let's not forget, the mid-range is where Sony's had its greatest recent successes, with the XF9005 series receiving two What Hi-Fi? Awards last year - one at 49in (KD-49XF9005) and one at 65in (KD-65XF9005). Predictably, we've got high hopes for the XG9505 series that replaces it. Below that series are a whole load of more affordable 4K models at a variety of sizes, and there's even a Full HD at the bottom of the range. Sony is sticking with Android TV as the operating system for the vast majority of its 2019 models, which means most of the big streaming apps will be built-in, including Netflix and Amazon Video in 4K HDR, Google Play Movies & TV, BBC iPlayer, Rakuten, Plex and Spotify. Sony is also once again adding YouView to its 2019 Android sets, which means they'll have the UK catch-up apps that other Android TVs lack. Sony seems keen to support as many picture formats as possible. In terms of HDR you get standard HDR10 and HLG across the whole range, plus Dolby Vision on the top sets. Those top models are also IMAX Enhanced and have the Netflix Calibrated preset for watching Netflix content as intended. The only obvious omission is HDR10+, which is a shame but unlikely to be the cause of any great heartache - at least for the time being. Sitting pretty at the very pinnacle of Sony's 2019 TV range isn't an OLED but an LCD, which might seem odd at first glance but makes sense when you consider that said LCD has an 8K resolution. In fact, this - the ZG9 (Z9G in the US) - is Sony's first 8K TV. Only available in very large sizes (85in and 98in), the ZG9 doesn't yet have a release date or price but will undoubtedly cost a very pretty penny when it launches. It's a large and imposing set, but one with a good deal of industrial elegance. It uses a direct LED backlight (figures for peak brightness and individual dimming zones are yet to be confirmed), which adds to the depth of the set, as does a sound system that consists of two speakers above the display and two below and is designed to make the audio sound as if it's coming from the screen. The 8K resolution necessitates the enhancement of a couple of existing Sony picture features. 8K X-Reality Pro takes care of the upscaling, using a new, dedicated 8K database for apparently more precision and detail, while 8K X-tended Dynamic Range Pro boosts brightness when necessary in specific areas and works in conjunction with the Backlight Master Drive feature, which independently controls the backlight's LED zones. Running the show is the X1 Ultimate chip last seen on Sony’s previous Master Series TVs, the ZF9 and AF9, and brings with it features such as X-Motion Clarity - the latest version of the company’s much-loved motion processing. X-Wide Angle, meanwhile, is designed to improve viewing angles when compared to other backlit TVs. Android TV also brings with it Google Assistant integration, and the ZG9 is ‘Works with Alexa’ certified, too. What’s more, the microphone is built into the bezel of the TV, so there’s no need to dig up the remote and hold a button down in order to issue your voice commands. Speaking of the remote, Sony has finally, after enduring years of complaints from us and others, changed its remote control. The new zapper avoids the overly stripped-back approach of many rivals, but is vastly slicker and more ergonomic than its predecessor, with better spacing between buttons and what instinctively feels like a more intuitive layout. It uses RF, too, so doesn’t require line-of-sight for operation. Sony is perfectly happy to admit that its new AG9 OLED (A9G in the US) differs from its AF9 predecessor largely in terms of design and sound, rather than in picture. Not that we see that as a big problem: the Sony AF9 was one of the best TVs of last year. As mentioned, the AG9 is a 4K model, and it comes in smaller sizes than the ZG9 - 77in, 65in and 55in. The big design departure is that the AG9 stands properly upright where the AF9 adopted a leaned-back stance. The move from an easel-like design necessitates the introduction of a pedestal, but said pedestal is decidedly unobtrusive. On the sound front, the AG9 actually has fewer drivers than the AF9 it replaces, with a switch from a 3.2 to a 2.2-channel system. Refinements apparently result in a richer, more spacious sound, though, and the continued use of acoustic surface technology, which uses actuators to vibrate the whole screen and generate sound, should mean that once again sound and picture are well integrated. Sitting just below the Master Series models is a new, full array LCD model designed to bring the Master Series approach to a wider audience. The XG95 (X950G in the US) will be available in 55in, 65in, 75in and 85in versions, with prices starting at £1899. The XG95 gets the X1 Ultimate chip of Sony's flagship sets, and boasts an innovative sound solution that includes two "sound positioning" tweeters that help tie the audio to the onscreen action. If you're after a Sony OLED but can't stretch to the AG9 Master Series model, the AG8 (A8G in the US) could be the TV for you. Available in 55in and 65in screen sizes, the AG8 gets the X1 Extreme chip rather than the X1 Ultimate of the AG9, and that means it misses out on some of the most advanced picture processing features, but the core experience won't be vastly different. At heart, this is pretty much a smaller version of the XG95 above, but with some of the specs slightly downgraded. It's got the X1 Extreme rather than X1 Ultimate chip, for example, and it lacks the fancy Acoustic Multi Audio speaker arrangement. Still, if you're looking for the most advanced 49in telly that Sony will sell you, this is it. As far as we can tell, this specific model is not intended for launch in the US. One rung down from the XG95 is the XG85, an edge-lit 4K LCD set. It gets a lesser version of the X1 chip so loses some of the more advanced picture processing features, but it does get the fancy Acoustic Multi Audio sound solution. The core models have the suffix '8505', but there are also versions of the TV with slightly different model numbers. These get a slightly more advanced version of Sony's Motionflow motion processing: 8505 models have Motionflow XR 800Hz, while 8596 and 8796 variants get Motionflow XR 1000Hz. Some models may also be exclusive to specific retailers. This series starts at £1399, so is usefully cheaper than the XG95. The XG83 models are pretty much smaller versions of the XG85s above, albeit without the Acoustic Multi Audio or Dolby Vision support. Prices here start at £999. The XG81 comes in three sizes: 49in, 55in and 65in. Interestingly, the smallest model is an edge-lit set, while the other two have direct LED backlights. All three of the TVs do without Sony's X1 processor, so picture features are comparatively limited, but you do still get the Android operating system and its array of apps. This could be a good choice for those looking for a fairly big TV on a budget. The only differences between the XG80 and the XG81 above are design-related. The XG80 stand is plastic, while the XG81 has a slim-line metal stand. The XG80 also has a less premium, 'rubber surface' remote, and is available in a couple of extra sizes. The XG70 is Sony's entry-level 4K TV. The biggest difference between it and the XG80 is the removal of Android, with a simpler, more stripped-back smart TV offering taking its place. Fear not, though, the XG70 still has popular apps such as Netflix and YouTube, and it features a Freeview Play tuner. This is another series with a number of different suffixes, ranging from the standard XG7002 to XG7003, XG7073 and XG7093. Once again, the differences are mostly in the motion processing: XG7002s have Motionflow XR100Hz, XG7003 and XG7073 get Motionflow XR 200Hz, and the XG7093 is a Motionflow XR 400Hz model. The difference between the XG7003 and XG7073 is the finish: the former is black, the latter silver. Full HD clings on in Sony's 2019 line-up with just one model - the WG66. Available in two sizes (43in and 50in), the WG66 has an LED edge backlight and the simplified smart platform of the XG70 above.